The tough things about names are trying to live up to them. When you’re called the “Incredible Hulk,” well, you have to make sure that you’re doing all sorts of incredulous things. You can’t just stop down to the local coffee shop and grab a drink. No, that’s far too credible for the Hulk! And, how about the Wicked Witch of the West? Right there, ingrained her very name is a constant statement about her ideology. No petting puppies or offering children candy for that green lass. It’s gotta be non-stop evil behavior or people are going to get rather confused! Of course, the naming conventions can certainly work the other way around, too. Take our buddy the ‘Cowardly Lion.’ Now, is it even possible to get a more unfair rap!? Remember that this mighty beast lives in the same world with the Wicked Witch. Certainly, we’ve got to understand how things came to this point. Wouldn’t we all be pretty spooked if we live in a forest of angry living trees next to a monster patch of sleep-weeds, and always at threat of a bunch of flying monkeys lead by a green flying itch who has to work pretty hard to live up to her name!? Who wouldn’t be a bit on the freaked out side!? 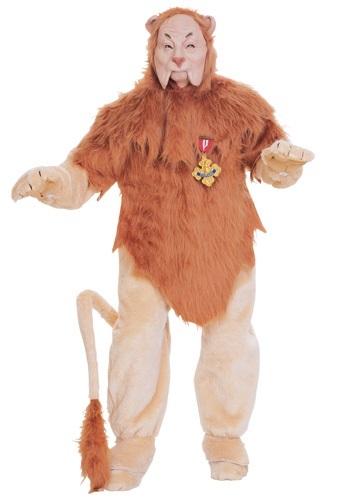 That said, there is no reason that we have to sentence the poor guy to permanent cowardice, and you can help to show that ferocious side with this Authentic Cowardly Lion costume. This officially licensed body suit has a dark brown fur overlay and a long and mighty 47” tail. The molded vinyl face mask helps you transform completely into the lion well known from the film and the mittens and boot covers will give you the claws to fight off any of those nasty monkeys. And, if cowardly isn’t your deal, all you need is to grab your Medal of Bravery show off your roar! Whether you’d like to go timid or fierce, you’ll be all authentic and that witch better watch out!